Socrates considered the debate in such settings unedifying, pointless and unworthy—in a word, “eristic”. 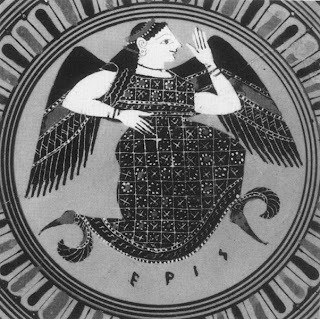 Eris was the Greek goddess of strife (the Roman Discordia). It was Eris who cunningly dropped a golden apple with the inscription “to the fairest” into a feast, inciting three goddesses—Hera, Athena and Aphrodite—to bicker over who deserved it and thus launching the ten-year Trojan War. Eris is present in presidential debates, in court rooms and wherever people are talking not to discover truth but to win. Eristic, from the ancient Greek word Eris meaning wrangle or strife, often refers to a type of dialogue or argument where the participants do not have any reasonable goal. The aim is to win the argument, not to potentially discover a true or probable answer to any specific question or topic. Eristic dialogue is arguing for the sake of conflict as opposed to the seeking of truth.